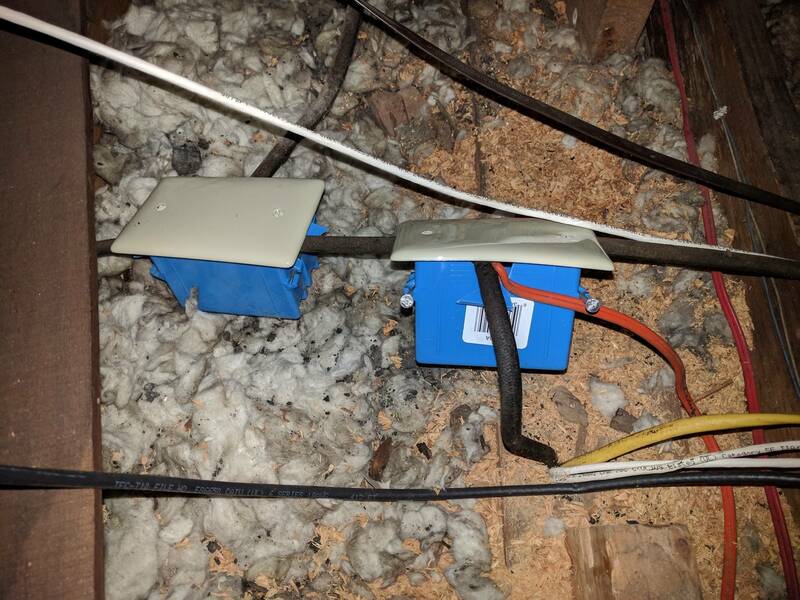 This doesn't look like it should fly to me, but the "electrician" hired by the seller of this property is arguing that this is an acceptable way to put an open splice into an box. I know this shouldn't be allowed, but is there phrasing in the code to support this being unacceptable? Their contractor is saying it just needs to be in a box, and if he staples it down within 8" it is fine. He "repaired about 20 open splices this way. 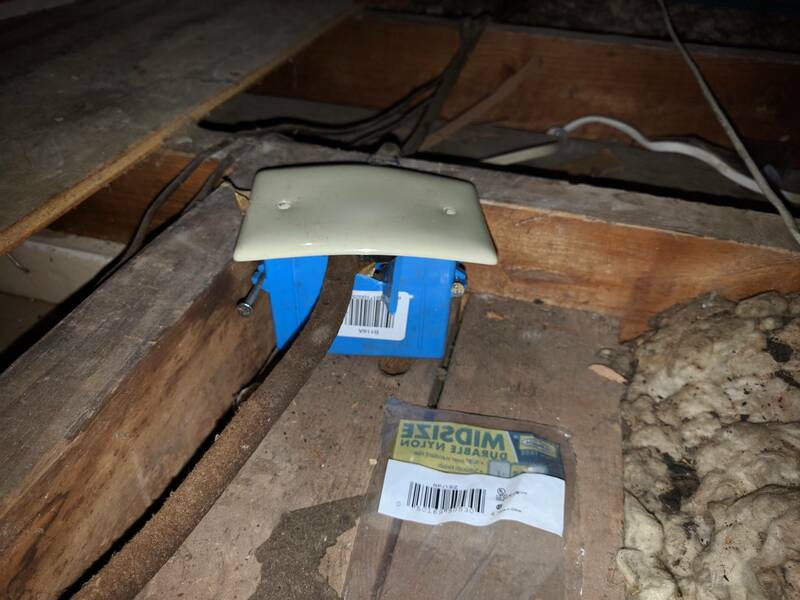 You can see how he just modified the boxes and placed the open splices into them as they were before and just left them all over the attic like this. What kind of tradesman takes this little pride in their work? (A) Openings to Be Closed. Openings through which conductors enter shall be closed in an approved manner. 314.23 Supports. Enclosures within the scope of this article shall be supported in accordance with one or more of the provisions in 314.23(A) through (H). 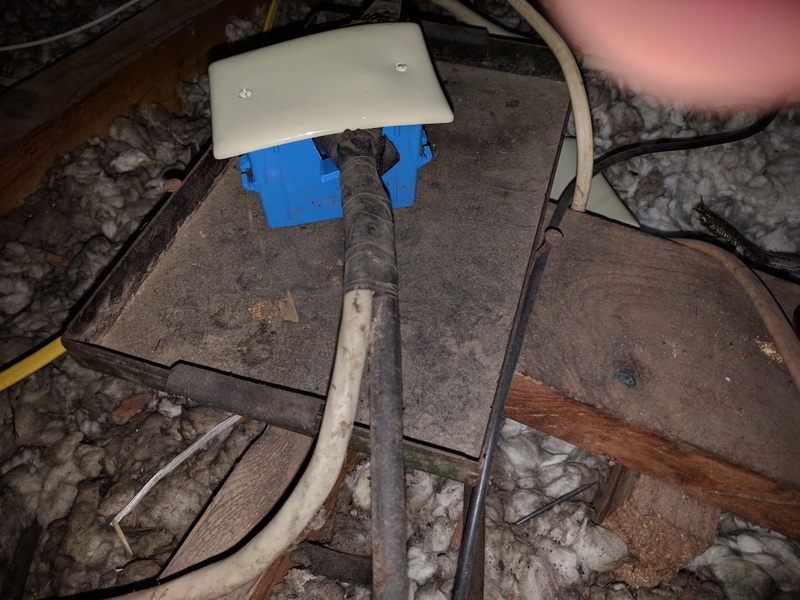 Note that nowhere in the subsections does it allow for a box to flop loose on some insulation, supported only by cabling that is not strain-relieved to the box by an approved means (such as a cord grip). 314.16 Number of Conductors in Outlet, Device, and Junction Boxes, and Conduit Bodies. Boxes and conduit bodies shall be of an approved size to provide free space for all enclosed conductors. In no case shall the volume of the box, as calculated in 314.16(A), be less than the fill calculation as calculated in 314.16(B). The minimum volume for conduit bodies shall be as calculated in 314.16(C). The provisions of this section shall not apply to terminal housings supplied with motors or generators. Informational Note: For volume requirements of motor or generator terminal housings, see 430.12. Boxes and conduit bodies enclosing conductors 4 AWG or larger shall also comply with the provisions of 314.28. (A) Secured in Place. Raceways, cable assemblies, boxes, cabinets, and fittings shall be securely fastened in place. Support wires that do not provide secure support shall not be permitted as the sole support. Support wires and associated fittings that provide secure support and that are installed in addition to the ceiling grid support wires shall be permitted as the sole support. Where independent support wires are used, they shall be secured at both ends. Cables and raceways shall not be supported by ceiling grids. (A) Single Conductors. Single conductors specified in Table 310.104(A) shall only be installed where part of a recognized wiring method of Chapter 3. Exception: Individual conductors shall be permitted where installed as separate overhead conductors in accordance with 225.6. (B) Conductors of the Same Circuit. All conductors of the same circuit and, where used, the grounded conductor and all equipment grounding conductors and bonding conductors shall be contained within the same raceway, auxiliary gutter, cable tray, cablebus assembly, trench, cable, or cord, unless otherwise permitted in accordance with 300.3(B)(1) through (B)(4). 110.12 Mechanical Execution of Work. Electrical equipment shall be installed in a neat and workmanlike manner. Informational Note: Accepted industry practices are described in ANSI/NECA 1-2010, Standard Practice of Good Workmanship in Electrical Construction. and other ANSI- approved installation standards. (A) Unused Openings. Unused openings, other than those intended for the operation of equipment, those intended for mounting purposes, or those permitted as part of the design for listed equipment, shall be closed to afford protection substantially equivalent to the wall of the equipment. Where metallic plugs or plates are used with nonmetallic enclosures, they shall be recessed at least 6 mm (1/4 in.) from the outer surface of the enclosure. In my jurisdiction, the owner (and his contractor) is responsible for making sure there are no violations of fire code and building code, including electrical code, whether or not anyone inspects prior to a catastrophe. 110.3 (B) Installation and Use. Listed or labeled equipment shall be installed and used in accordance with any instructions included in the listing or labeling. 110.12 Mechanical Execution of Work. Electrical equipment shall be installed in a neat and workmanlike manner.... (B) ...There shall be no damaged parts that may adversely affect safe operation or mechanical strength of the equipment such as parts that are broken; bent; cut; or deteriorated by corrosion, chemical action, or overheating. Conductors Entering Boxes, Conduit Bodies, or Fittings. Conductors entering boxes, conduit bodies, or fittings shall be protected from abrasion and shall comply with 314.17(A) through (D). (C) Nonmetallic Boxes and Conduit Bodies....Where nonmetallic sheathed cable or multiconductor Type UF cable is used, the sheath shall extend not less than 6 mm (1⁄4 in.) inside the box and beyond any cable clamp. In all instances, all permitted wiring methods shall be secured to the boxes. Exception: Where nonmetallic-sheathed cable or multiconductor Type UF cable is used with single gang boxes not larger than a nominal size 57 mm × 100 mm (21⁄4 in. × 4 in.) mounted in walls or ceilings, and where the cable is fastened within 200 mm (8 in.) of the box measured along the sheath and where the sheath extends through a cable knockout not less than 6 mm (1⁄4 in. ), securing the cable to the box shall not be required. Multiple cable entries shall be permitted in a single cable knockout opening. I doubt that cutting or drilling your own holes in a listed and labeled box (as shown in your situation) counts as "a cable knockout", thus the exception would not apply. Also, some of the photos show boxes more than "single gang", nor are ANY of them "mounted in walls or ceilings", if they're shown in unfinished attic spaces. Most likely these are taut splices, twisted/added onto cables by cutting themmid-run. That means there is not the free wire length needed in the box. 300.14 Length of Free Conductors at Outlets, Junctions, and Switch Points. At least 150 mm (6 in.) of free conductor, measured from the point in the box where it emerges from its raceway or cable sheath, shall be left at each outlet, junction, and switch point for splices or the connection of luminaires or devices. Where the opening to an outlet, junction, or switch point is less than 200 mm (8 in.) in any dimension, each conductor shall be long enough to extend at least 75 mm (3 in.) outside the opening. It would be some real work to fix it properly, but certainly less work than all that hacking up and stuffing. This electrician just didn't have confidence or experience. I would have got some 4" or 4-11/16" square metal boxes (coz that's what I work in), place them smartly to try to include 2 of the 3 cables with available length,then run new Romex to replace the third. Take that second pic, one of the three cables goes straight down, I'd disassemble it to preserve every inch of that cable, have that cable make a back entry into a 4" square shallow box, then probably have to sacrifice the other two. 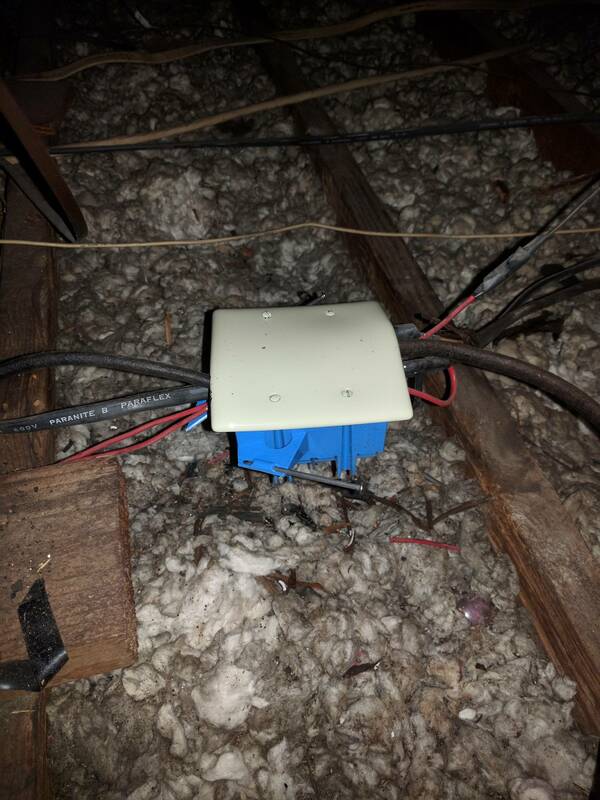 Can I install junction boxes in a closet, and if so, what kind of box? Why can the connections of a recessed light be buried in drywall, but not junction boxes? How many times can you extend NM-B with splices/junction boxes? How to open this electrical junction box? Is updating/avoiding this splice worth it, and if so, what's the easiest way to plug the hole?